We cater for a range of accessibility needs. It’s important to us that everyone coming to Belvoir St Theatre has the same experience, regardless of their physical abilities, so we’re pleased to offer the following range of services and facilities to make your visit as enjoyable as possible. Belvoir St Theatre can accommodate patrons in wheelchairs and also their guests. Please book ahead and let Box Office know of any special needs so we can ensure that you are looked after. There is lift access to all levels. We also have an accessible toilet in our foyer area. Please refer to the map of our foyer for further detail. There is one accessible parking spot directly outside the theatre. (Unfortunately we are unable to book this accessible parking spot with council.) There is also some unlimited parking available directly opposite the theatre after 6pm and in some surrounding streets. Special note: There is a lift at the Chalmers St/Devonshire St exit of Central Station, from the concourse to the street. Belvoir offers Vision Australia’s live audio description service. The performers’ actions, expressions and gestures are narrated by professional describers via a small earpiece which is provided to guests pre-show. The service is designed to provide real-time imagery during gaps in the dialogue on stage. There is an induction coil hearing loop in the Upstairs theatre, which can be accessed via the t-switch on hearing aids. It is currently limited to a specific area of the theatre, in the middle bank of seating, rows E-J. Please see the illustration of the Upstairs Theatre Seating Plan (top right of this page) to see exactly where this is. If you require seating in this area, please book early and let our Box Office know. We have one power pack and one pair of over the head headphones that can be used with the hearing loop if you discover you are without your hearing aid. Please ask for this at the Box Office. For hearing impaired patrons we provide mobile device captioned performances. These captions will detail actors’ dialogue, adlibs, asides, song lyrics, musical descriptions and other sound effects. To receive captions, simply download the Go Theatrical! app on your iPhone or Android. iPods are available for hire from our Box Office but are limited in number and must be booked in advance. Click here to book. Belvoir is a Companion Card affiliate. The Companion Card enables people with a disability who require attendant care support from a companion to attend Belvoir productions without incurring the cost of a second ticket for their companion. Cardholders must present their card when booking or purchasing a ticket. 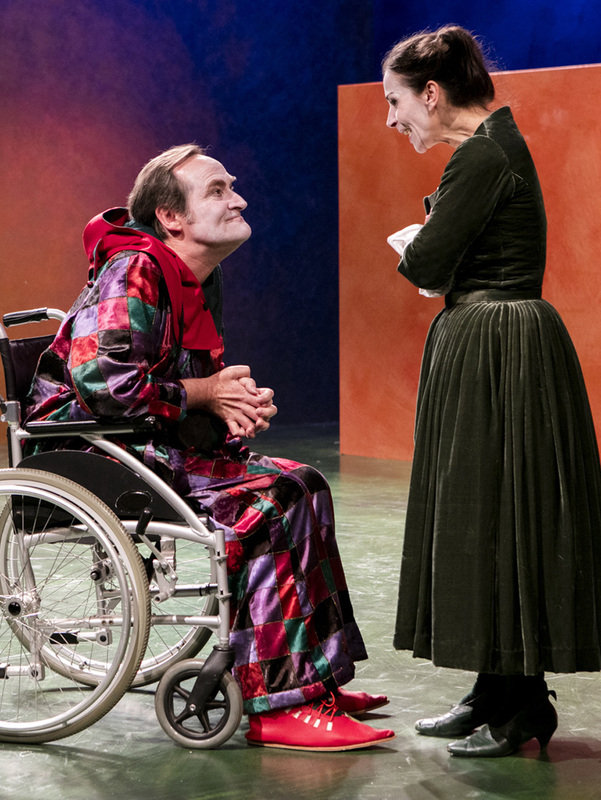 Keith Robinson and Lucia Mastrantone in Twelfth Night. Photo: Brett Boardman.